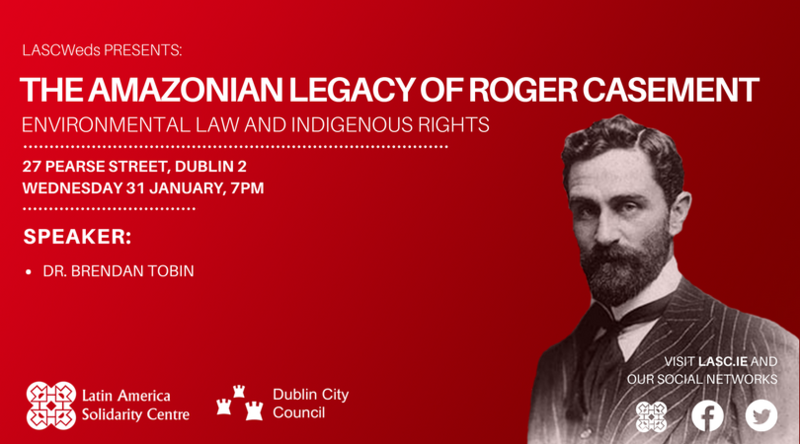 From the Congo to the Peruvian Amazon, Irishman Roger Casement left a strong and lasting legacy of human rights and environmental protection. Now, more than a century after his execution, LASC looks back over the lingering influence of this extraordinary individual in Latin America. Dr Brendan Tobin: Born in Galway, Dr. Tobin qualified as a barrister in Dublin before emigrating to Peru in 1992, where he dedicated himself to the practice of environmental law and the promotion of indigenous peoples’ human rights. Over the past 25 years his work has focused on protection of the lands, resources and traditional knowledge of Indigenous peoples in many parts of the world. In 2012 he was awarded a PhD in Human Rights from the Irish Centre for Human Rights, NUIG and in 2014 he published the monograph monograph Customary Law, Indigenous Peoples and Human Rights – Why Living Law Matters. In July 2016 Dr. Tobin travelled to the Colombian Amazon to retrace the steps of Roger Casement on the 100th anniversary of his death.